A splitter divides a satellite singal in two. A splitter in the cable from a satellite dish divides the signal into two parts to connect to two receivers. However the signal in each direction loses more than half its power. An additional splitter will cut the signal power in half again. Multiple splitters may reduce the signal to such a low power level that it's unusable. The cable from a satellite dish may work for distances from 100 to 200 feet, depending on the type of cable used, the signal power at the output of the low noise block amplifier (LNB) in the dish and the sensitivity of the receiver. RG6 is the most common cable used, but WF100/PF100 has less loss and should be used for distances over 100 feet. You can't calculate and exact distance without knowing the exact output power of the LNB and the exact sensitivity of the receiver, expressed in decibels (dB). 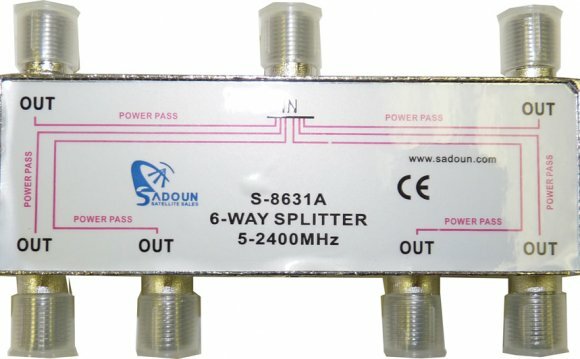 A splitter reduces the signal by at least 3.5 dB, which results in two signals with less than half the power of the original. Some splitters have even more loss. In general calculations, a splitter reduces the usable length of the cable by half. But the signal level also loses power as it travels along a cable. If you have a usable signal at 200 feet, a splitter may reduce the signal so low you can't use it on either side. If you put the splitter right at the dish, each receiver must be within 50 to 100 feet. Assuming a worst case scenario, without a splitter, you can install the receiver at 100 feet from the dish. If you install a splitter 50 feet from the dish, each side can only go an additional 25 feet. With another splitter connected to it, each side can go an additional 12 1/2 feet, and with another roughly six more feet . With a splitter at the dish and another at 25 feet from it, the outputs can only go an additional 12 1/2 feet, making an overall distance of 37 1/2 feet.